On Tuesday, Paula left the following comment: Love your style; please share your secrets with us and post your favorite on line shopping sites! I answered the first part of her request yesterday (my secrets) and will answer the second part of her request today. Since I prefer to try on items en femme before I purchase them, I use the websites to scope out what is currently available at the brick and mortar stores before I go shopping en femme. I almost never buy anything online from a store that I can visit in person, but I almost always check out their websites beforehand. One problem with that strategy is that the brick and mortar store may not have everything that is online, but when that occurs, I usually find something else that is just as nice. On the other hand, there are websites that do not have brick and mortar stores where I do purchase items without being able to try them on first. My success rate with these online-only stores is about 50%. Either the item does not fit correctly or I do not like the way the item looks on moi. Although, many of these websites make it easy to return items (sometimes for free), I have been buying less from these websites lately because of the lack of success rate and the resulting return issues. These days, my go-to online-only stores are Avon, ideel (formerly ideeli) and Nine West. Avon - Yes, the Avon lady people sell very nice clothing at reasonable prices and I have been buying more from them lately. And my success rate with Avon is very high, probably around 90%. By the way, I am an Avon lady and receive a discount on items I buy, but no so much so that the price sways me to buy stuff I would not buy otherwise. ideel - ideeli sold nice close-out clothing at bargain prices and I purchased items from them frequently. Then they got bought out, changed their name to ideeli, increased their prices and beheaded their models. Since then, I have bought little from them and have a $60 credit that has been sitting there for months, but I still visit their website frequently hoping for the best. Nine West - They have a vast selection of shoes and their sizes are consistent, but their prices are high, so I only indulge when they have a sale, which is often. By the way, Nine West does have a local brick and mortar store, but they only stock sizes smaller than my size, so their brick and mortar store is useless to me. As for brick and mortar stores I check out online before I show up in person, they are Dress Barn, Fashion to Figure, Nine West, and Payless. I also check out Macy's and JCPenney, but their inventory is so huge that what I see online often does not match what is in the store, so I usually don't bother unless I am looking for something special. DressBarn also known as DressBarn - This is one of my favorite clothing stores. Their styles are working girl oriented, but their sizes are a little inconsistent, so I always go to the store to try on what I see online. And, by the way, they are very trans friendly! Fashion to Figure - This is my other favorite clothing store. They specialize in larger sizes and their styles are younger and sexier than DressBarn. But like DressBarn, their sizes are all over the place, so an in person visit is recommended. Payless - This shoe store has a nice selection of reasonably-priced shoes in the larger sizes that I require. However, their sizes are very inconsistent. I own Payless shoes ranging from size 10.5 to size 13 that all fit, so going to the store and trying on their shoes is a must in order to get the right size. That's all she wrote. 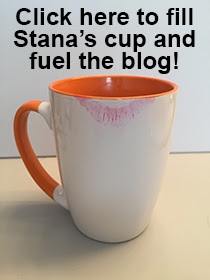 Again, if you have any questions, please ask (stana-stana at sbcglobal.net). Wearing Rachel Zoe (dress), Eugenia Kim (hat), 10 Crosby (booties) and (ALC)bag. Actor Stephen-Fry femulating in British television’s Jeeves and Wooster (1993). Being a size 26 makes it hard for me to find good clothes sometimes, but I have my sources! I buy a lot of clothes from the OSP Group online stores (Woman Within, Roaman's, Jessica London, BCOutlet, OneStopPlus); I have a good "feel" for how their clothes fit me by this point and am rarely disappointed. I also buy on eBay; I know the fit of certain brands by now, and can find good clothes and shoes that way. In the "real" world, I have shopped at Walmart, Target, and Lane Bryant for clothes. Much of my makeup comes from Walgreen's or the grocery store, but I do have an Ulta rewards card now, too! Can we talk about Payless Shoes? They're a god send in that you can find women's shoes in 12/13 regular and wide in the right store. Most places stop at size 10, which I think we wouldn't be able to fit our toes into. Male shoe size for me is consistently a 12 with my right foot being slightly larger, this is critical for tight shoes like my Sidi road bike shoes. My first set of shoes, long ago purged, were a set of size 12 mary-janes from payless (12 was the largest that store carried). They were very tight on my feet and not very comfortable. My new collection has a set of ballet slipper/flats that are a loose 13-wide and a set of black patent pumps in 12-wide. I tried a 13-regular pump, but my left ankle seemed more stable in the tighter shoe, and they're still comfortable. The chance to go in and wear the shoes for 5 minutes makes all the difference. By far, most of my footwear comes from Payless. Even my boy footwear! I love shopping there when they have BOGO. I like to think it blows their mind when I cash out buying a pair of woman's high heels and a pair of men's sneakers, but I am sure they are used to it. So totally used to it. But I prefer to have lady's at the front counter. I purchased by flats with a guy in the store, and I had to take deep breaths to calm down while I tried some on. I suspect that the store I go to has lots of TG clients as no other Payless in the area carries the larger sizes. The last sales associate even gave me the soft sell on tights :) I was so close to saying yes, but I'd just picked up some from Target.